Setcom Corporation sits at 3019 Alvin DeVane Blvd. Alvin DeVane was so proud of the South Austin street bearing his name that the retired Austin Police Department lieutenant had a book filled with photos of himself with friends, family and such Austin dignitaries as Darrell Royal standing underneath it. “He loved it. He was still trying to figure out how to turn it into a toll road,” DeVane’s daughter Lisa Fisch joked Monday. DeVane, a 26-year veteran of the department, died Sunday. He was 88. DeVane was described by friends and family as a friendly, well-respected officer who saw himself as a representative of Austin. After retiring in 1983, he stayed active as an amateur radio operator and barbershop singer. DeVane enlisted in the Army Air Corps in 1943. Stationed at Bergstrom Field in Austin, he met his wife, Antoinette, at a USO dance in June 1944; they were married that September, Fisch said. 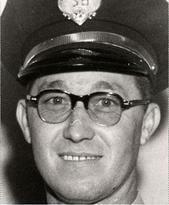 DeVane joined the Police Department in 1957. Daughter Teresa Crail said she thinks he signed up because he wanted to be around people and protect them. DeVane had a wide, varied career, patrolling on foot and on a motorcycle. He later supervised the traffic unit, which put him in charge of security for presidents and other visiting officials. “Everyone will tell you he’s the nicest guy in the world, and a good policeman,” said Con Keirsey, a retired police captain who served with DeVane in the 1960s. Fisch said that when her father retired, she wanted to get a street named after him as a gift. Getting an existing street changed proved to be a red tape nightmare, she said, so she found a developer who would name a new street after him in South Austin. Fisch said the city approved the name in 1984 even though DeVane was still alive — an unusual move. She said it was because he was injured in the line of duty in the 1960s . Alvin DeVane Boulevard sits between Ben White Boulevard and U.S. 290. Former Austin Mayor Carole Keeton Strayhorn said he was dedicated to protecting people and making them feel good. “He was Austin’s finest at its finest,” she said. DeVane’s wife died in late November. He is survived by four children and seven grandchildren. Funeral services are scheduled for 11 a.m. Thursday at St. Louis Catholic Church on Burnet Road.